SNORKEL: YES | DEPARTS: DAILY | LUNCH: ON REEF & CAPE TRIBULATION | PRICES | ASK A QUESTION? Add a 10-Minute Scenic Helicopter Reef Flight or return to Cairns on 20-Minute Scenic Helicopter Reef Flight. GPS Activated Audio Commentary available in Spanish, German, Italian, Japanese, French and Chinese. Bus Transfers are included on all 3 Day Tours! From a Cairns Hotel! You can also upgrade your Kuranda Tour to include the Army Duck + Wildlife Park + Aboriginal Dancers + Buffet Lunch! Current Special: This Tour package Includes FREE Bus Transfer from a Cairns Hotel. Quicksilver really is the most famous reef tour operator here in Cairns & Port Douglas, they operate the biggest Wave Piercing Catamaran Boat that is very stable in all weather conditions. This tour will suit the person who really wants the very best experience possible. A perfect day for the family with small children, swimmers and non-swimmers wanting to try snorkeling, Reef Magic Cruises have a fantastic reputation for spending 5 hours out on the Great Barrier Reef. Optional Extra Upgrades: Please see the price table above. You can add Rainforestation Army Duck Tour + Wildlife Park + Aboriginal Dancers + Buffet Lunch. Day 3 of your Cairns tour package is to visit Cape Tribulation is located about a 2.5 hour drive North of Cairns. After receiving its World Heritage Listing in the 1980's, visiting this region in a small group tour really is the only way to learn about the World's Oldest Living Rainforest, from spotting wild birds and rainforest lizards to beautiful freshwater streams and guided boardwalks thru the rainforest canopies. A fantastic way to spend the day learning about Cape Tribulation & Daintree National Park. Experienced guides will deliver intiment knowledge of the local aboriginal cultures, flowers, plants and wild animals like the endangered Cassowary and the not so endangered Salt Water Crocodile. 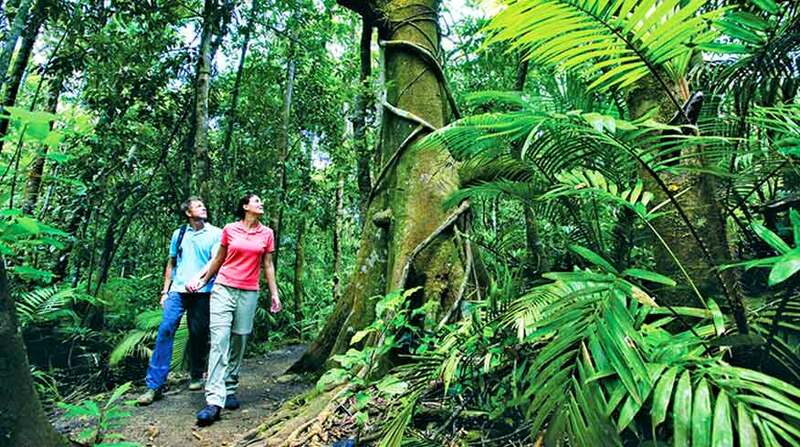 Daintree Rainforest is a World Heritage Listed National Park.